Refining and petrochemical industries operate complex energy systems based on several steam pressure levels, with fired boilers producing high pressure steam and burning different fuels, cogeneration of steam and electricity, dealing with fuel gas production/consumption imbalances, external fuels and electricity imports/exports with their corresponding commercial contracts and finally having to comply with many environmental constraints. Different economic trade-offs provide many challenges to operate the site wide energy system at minimum cost. For instance, the trade-offs among electrical power, steam and fuels networks. During a typical project, a detailed model of the steam, fuels, electricity, boiler feed water and condensates systems is built, including all the interactions between these systems, real plant constraints and degrees of freedom of their operation. Such a model is scheduled to perform automatic executions of the optimization of the entire system and is continually populated with validated live data from the process. Besides the optimization, Key Performance Indicators (KPIs) are also calculated and sent back to the Site Plant Information System or DCSs for Operations and Management use. Other monitoring aspects include the continuous audit of the energy system so the data can be relied on for evaluating the value of energy production and usage, and waste can be eliminated. Recommendations given by the model are taken into account by operations on a daily basis. The same model used for the online, real time optimization, is also used in stand alone mode, populated either with current or historical data, to perform case studies for planning or to evaluate alternatives for a better operation of the energy system. As a result of the project, organization of the information of the refinery energy system into one model and a single environment that everyone has access to, is accomplished. Furthermore, the project allows for the understanding of all the decision variables and the associated constraints, which sometimes are hidden or ignored. Additionally, the centralization of the responsibilities for the energy system's optimal operation is usually achieved. The importance of a proactive support program, which is underway for many of our clients, with the goal of ensuring that the benefits of the project are sustained and that the health of the model is kept in check over time, are also described. In almost all of the cases, these complex utilities and energy systems have several degrees of freedom. Proper manipulation of the degrees of freedom with the aid of cost-based optimization software can result in significant operating cost savings. Since the electrical system represents one of the main economic trade-offs with the steam system, electrical deregulation provides many new challenges to operate the overall combined energy system at minimum cost. Other important aspects are that utilities systems are continuously evolving (changes are frequent) and that sometimes, there is a lack of sensors and measurement errors that needs to be addressed properly. Moreover, utilities systems have several constraints that come usually from the operational and contractual sides. For example, minimum and maximum steam production capacity in the boilers, the need to maintain a steam production cushion due to safety reasons, or the fuels and electric power quotas and penalties. Finally, it is important to mention that traditionally, given the complexity of the systems, the optimization of the utilities is often managed at the level of each individual Plant or Area. But the optimization of each individual Area does not necessarily give the true overall site optimum. Moreover, an attempt to optimize a whole site based on an isolated view of each Plant at a time could be worse than doing nothing. In the dynamic operational and economical environment of a Plant, implementing the proper actions necessary for the optimum utilities system management can only be done with the aid of an on-line tool. It should execute in an unattended, automated way, providing at any time the right answers to the different users (from operators to engineers), with the man-machine interface appropriate for each one of them. 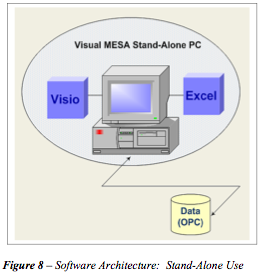 In order to successfully address all the items mentioned above, a software tool called Visual MESA has been developed. The original MESA program was developed in the early 1980's. Since the Visual MESA version was released in 1997, it has been implemented in more than 40 sites and is extensively in use to model and optimize the overall site energy and utilities systems. Experiences gained during more than 20 years of industrial projects deployed worldwide are commented (Refs. 1 to 10 are related to some recent projects). Some examples are explained in the following section. At the Petronor site, Spain's largest refinery (ref. 1) with a processing capacity of eleven million tons a year, the on-line model for energy management has been implemented. Its energy system is large and complex; therefore, the auditing and control of energy costs are a real challenge. A full model of the energy system has been built. All the constraints have been included and the model is continually populated with live, validated data. Performance monitoring is performed and includes the follow up of calculated equipment efficiencies using the validated data mentioned before. By auditing the energy system, imbalances are detected and diagnosed. As a result, the data can be relied on for evaluating the value of energy production and usage, and waste can be eliminated. Planning for a better operation of the energy system by performing case studies is usually done by using the validated model in off-line mode. Finally, it is important to mention that the optimization of operating conditions is performed on a continuous, day-to-day basis since the system was commissioned in 2005. As a result of the project, new sensors have been added and substantial savings in global energy costs have been achieved. The model includes the entire fuel, steam, boiler feed water, condensate and power systems. Steam is generated in several places, with both conventional boilers, heat recovery steam generators and a cogeneration unit with steam injection. The four steam pressure levels were modeled and all the units considered in high detail, including all the consumers and suppliers to the respective steam, BFW and condensate headers. Detailed efficiency curves of the biggest turbines were included in the model and they are adjusted continuously with on-line validated data. Electricity and fuel supply contract details have been included in the model. In particular, the purchased Natural Gas daily quota was rigorously modeled and the constraints respected during the routine optimization. In order to illustrate the obtained benefits, optimization results are shown in Figure 1. The results correspond to one day of operation using Visual MESA. Savings are indicated as a percentage of total energy costs. After implementing the optimization recommendations, operation is closer to the minimum global energy cost, as it can be seen in the plot, after 9:36. When the operator saw in the report potential savings higher than 1% of the overall utilities system cost, he implemented the optimization recommendations (in this case, a combination of changes in boiler loads and steam flows among production areas). 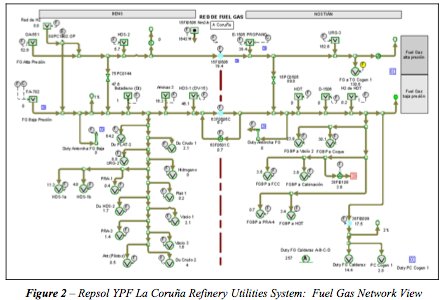 Repsol YPF La Coruña Refinery operates a large and complex energy system. The implementation project is described in detail in ref. 3. The refinery also operates high conversion units, including a Coke and FCC. The energy system is based around five steam headers and two cogenerations plants producing steam and electricity. The refinery has two main areas separated by more than 3 km from each other: "Nostián" or Conversion area is where the utilities plant area, FCC and Coke units are located, and "Bens" or Refinery area is where several consumers such as crude units are located. The steam network includes a "very high pressure" steam header, "high pressure" steam headers, two levels of "medium pressure" steam headers and "low pressure" steam headers. The "very high pressure" steam header starts in one of the cogeneration units. The "high pressure" steam is generated mainly in four boilers, the heat recovery steam generator at the other cogeneration unit, the Calcination unit, FCC and Hydrogen boilers. The major high pressure steam users are the FCC and Coke units, fuel oil heaters, a turbo generator and the cooling water system area. One of the levels of the "medium pressure" steam headers is supplied by letdown from higher levels (through turbines or letdown valves) and by the turbogenerator backpressure extraction. Users of this steam level are almost all the users at the Refinery area (Bens). The other level of "medium pressure" steam is supplied by letdown from upper levels (by letdown valves or turbines) and by the FCC, Coke, Vacuum and the medium pressure heat recovery steam generator of one of the cogeneration units. Users of this steam level are almost all units of the Conversion area (Nostián). The "low pressure" steam headers are supplied by letdown from upper levels (letdown valves and turbines), some steam generators and also flash tanks. The users of this pressure level steam are units in both the Conversion and Refinery areas. Electricity generation is performed by the two cogeneration units, including turbo generators. The refinery is usually an exporter of electricity. The refinery is also able to import electricity if necessary since it is connected to the electricity external grid. The electricity system is especially interesting because the usual condition is to sell to the market the contractual power at a given price and penalty (if not fulfilled), which changes on an hourly basis. With respect to the fuel gas network, there are several suppliers and consumers of fuel gas. The most important consumer is the gas turbine of one of the cogeneration units. When the fuel gas density or pressure decreases, propane is automatically added to the network. It is shown in Figure 2. MS Excel provides a familiar environment for users to generate reports and views for the simulation and optimization of the system. It also enables users who are not familiar with the model to take advantage of the information the software provides. 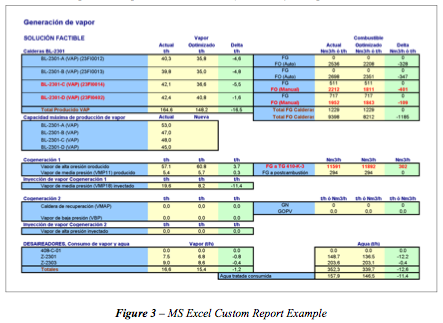 Figure 3 shows an example of a report generated. 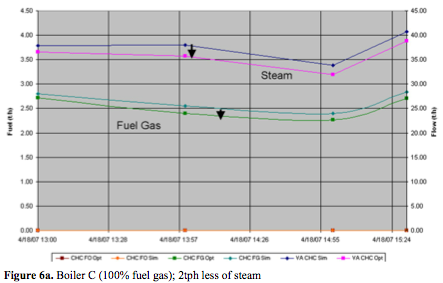 In the worksheet shown, steam generation and fuel consumption are reported for the current (simulation) and optimized values. 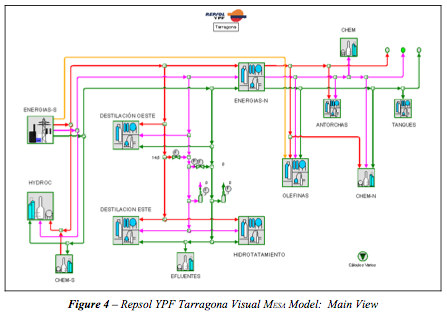 The Repsol YPF Tarragona Refinery, located in Spain, with a refining capacity of eight million tons per year of crude oil, operates a large and complex utilities system. The refinery shares its utilities system with a neighboring Olefins Plant (ref. 2) and is optimized as a whole. A complete model of the utilities system of the overall site was built (see Figure 4). The model contains the entire steam, boiler feed water, condensate and power systems. Steam is generated in several different units, with conventional boilers, gas turbine heat recovery steam generators and two cogeneration units. The five steam pressure levels were modeled and all the units considered in high detail, including all the consumers and suppliers to the respective steam, BFW and condensate headers. Since Visual MESA is an operations-oriented tool, the proper training of the operating personnel is a very important project step. The different shifts have been trained by using the finally deployed model. Inputs gathered from the operators during and after the training class have been very valuable to improve the reports and other displayed information. When analyzing the optimization recommendations, a foreman with coverage of the whole Refinery, Utilities and Olefins Units was the person with responsibilities to coordinate the overall optimization implementation on a day-to-day basis. First month: Base Line - Visual MESA being executed on-line, predicting the potential benefits but no optimization actions are taken. Second month: Operators trained and optimization suggestions are gradually implemented. Third month: Optimization recommendations are followed on a daily basis. Figure 5 shows the results of this test. Over that period, annualized savings of more than 2 MM €/year were measured. Fuels to boilers (i.e., FG and FO). 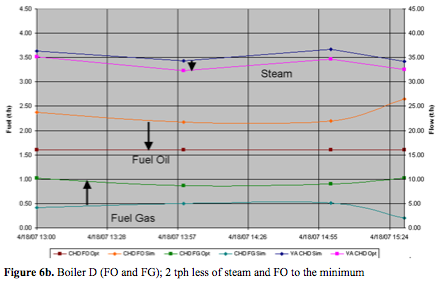 Figures 6a, 6b, 6c and 6d show the impact of the Manually-applied optimisation actions on steam production, fuel use and CO2 emissions reduction. Almost 1 tph less FO consumed. Approx 7 tph less high pressure steam produced. 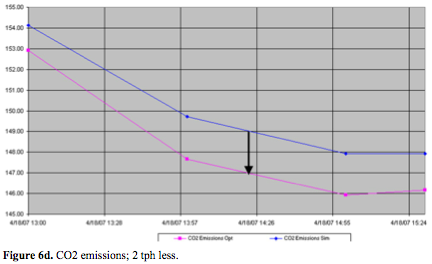 Approx 2 tph less CO2 emitted. Approx 200 kW more electricity imported (which was the lowest cost energy available). 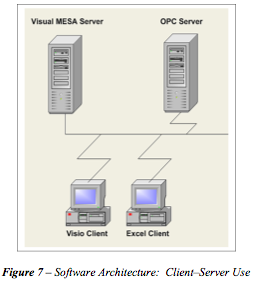 The software used in all the industrial project examples mentioned above is Visual MESA. Visual MESA is a computer program designed to model steam, boiler feed water (BFW), condensate, fuel and electrical systems. It is an on-line program that receives live plant data from the steam, fuel, condensate, BFW, and electrical system metering devices via a standard link to the plant information system. It typically works uninterruptedly retrieving on-line data from the process, evaluating continuously the utilities and energy system optimization alternatives and writing key performance indicators back to the plant information system. Main benefits that can be usually obtained are summarized in the following paragraphs. Understand how to improve the optimum steam/electrical system operation. Evaluate the economical impact of an operational change quickly. It helps plant personnel to find where steam waste is occurring in the steam system, provides information to account for it properly and identifies where the imbalances are and how they behave in time. Client-Server use (Figure 7): The purpose is to share the solutions, supporting multiple users. The Visual MESA server runs as a service on a PC. It automatically runs with no interruption every 15 minutes, writing results on the plant information system and generating reports. Any PC connected to the plant network can be configured to access the model and the reports. Users can connect in many ways (html, Excel, Graphical User Interface). Stand-Alone use (Figure 8): The purpose of this installation is for individual users to be able to run case studies on their own PCs, using a snapshot of the current model or any other model the user may have built and the current data or historical data (automatically taken from the plant information system via standard OPC Historical Data Access). The on-line capabilities are a relevant portion of the software structure. The models are created from scratch acquiring and relying on real-time data. A standard OPC-based (OLE for Process Control) protocol interface has been provided to perform a smooth and easy communication with the appropriate data sources, such as a Distributed Control System (DCS), a Plant Information system or real-time data base. Sensor data can be linked to the Visual MESA model simulation and optimization blocks by simply dragging and dropping the corresponding icons from the builder's palette and easily configuring the sensor object to protect the model from measurement errors and bad values through the extensive set of validation features provided. 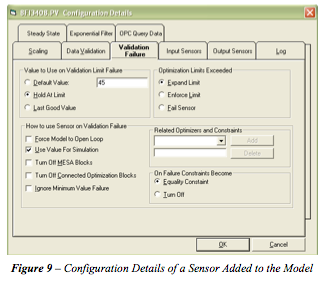 Figure 9 shows an example of the configuration options in case of sensor data validation failure. Building a model that realistically represents the utilities and energy system topology, includes all the optimization variables and constraints and, at the same time, captures all the system economics, especially the fuels and electricity contractual complexity, is a straightforward task when Visual MESA is being used. Continuous Variables: Such as steam production from a fired boiler or steam flow through a steam driven turbogenerator. It is also important to determine if the unit should be shutdown, recognizing its minimum operating limit. Discrete Variables: Where the optimizer has to basically decide if a particular piece of equipment will operate or not. 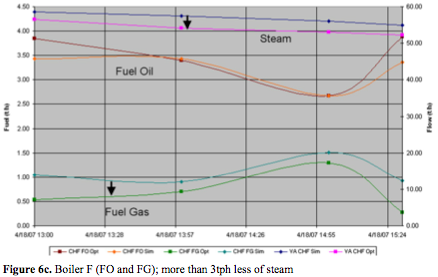 The most common occurrence of this kind of optimization in refinery steam systems is spared pump optimization where there is the need to choose which of two pumps to operate, one of which is driven by a steam turbine and the other by an electric motor. Direct Equipment Constraints: An example of a direct equipment constraint is turbogenerator power output. In a turbogenerator, the steam that flows through the generator can be optimized within specified flow limits but there will also be a maximum power production limit. Another example is the emission limit (for example, on NOx, SO2, particulate material, CO2, etc.) related to the different fuels burned. Abstract Constraints: An abstract constraint is one where the variable is not directly measured in the system or a constraint that is not a function of a single piece of equipment. An example of this type of constraint is a steam cushion (or excess steam production capacity). Steam cushion is a measure of the excess capacity in the system and provides a safety margin in case of an unexpected shutdown of a given steam generator. If this kind of constraint were not utilized, then an optimizer would usually recommend that the absolute minimum number of steam producers be operated. This is sometimes unsafe because the failure of one of the units could lead to the shut down of the entire facility. During this step data collection is done. This includes the Piping and Instruments Diagrams, a tags list from the Real Time Database (plant information system) and equipment data sheets. Software installation and connection to the Plant Information system is done at the beginning of the project. Develop a list of variables already controlled and how Visual MESA needs to relate to them. Identify any needed new control strategies or changes to existing strategies to implement optimization. As a result, the optimization suggestions can be achieved properly through the existing operating procedures and control strategies and structure. A complete model of the overall Energy System is built. The model includes the whole fuel, steam, boiler feed water, condensate and electrical systems. All the steam pressure levels are modeled as well as all the production units utilities network, with a high level of detail including all the consumers and suppliers to the respective steam, boiler feed water and condensate headers. Electricity and fuel supply contract details are easily included in the model, with the electricity market cost updated from the real time data base system tags, when available. The fuel gas network is usually also modeled, as it is involved with the steam and power generation equipment and all its constraints and degrees of freedoms are also taken into account by Visual MESA. A well-tuned model would generally be run at Level 3, with a run at Level 4 once in a while to evaluate potential operational changes. The SQP optimizer's job is to minimize this objective function subject to operating constraints in the system. Total Fuel Cost is determined from the fuel use of each boiler and combustion turbine multiplied by their respective fuel prices. Total Electric Cost is determined from the net electric use of each motor, load, and generator multiplied by their respective electric prices. The electric generation (power selling) is just negative electric use. The model can take into account the electricity price corresponding to the actual hour of the day as well as the penalties associated to selling more or less power than the market arranged exportation amount, if any. Miscellaneous Costs are normally used to charge for demineralised water coming into the system, but can be used for any other cost related to the energy system (for example CO2 emission cost). Calculations to model and optimize CO2 emission cost are also developed and run together with the electric, steam and fuel optimization and help choose the best fuel to use in boilers and gas turbines taking into account the emission costs. A standard feature of the software, the "constituents" can be used to model the emission produced by each type of fuel. The model and optimization configuration is reviewed with users. Model fine tuning and optimization results analysis is performed on a daily basis. Minor model modifications and additions or adjustments of constraints are done. At the end of this period, operators start using the tool every day. The model is in use by Operations for site-wide costs minimization and as the energy watch dog. Economic benefits already obtained are reviewed and improvements for the future are discussed. In addition to the main purpose of the real time online optimization, appropriate performance metrics can also be identified and performance targets can be set during the real time energy management project. Also, within the model calculation and reporting infrastructure, corrective actions in the case of detected deviations from target performance can be recommended. High level KPIs that monitor site performance and are geared toward use by site and corporate management. For example: Total cost of the utilities system, predicted benefits, main steam headers imbalances, emissions, etc. Unit level KPIs that monitor individual unit performance and are geared toward use by unit management and technical specialists. For example: plant or area costs, boilers and heaters efficiencies, condensate recovery percentage, use of energy per unit of production, etc. The metrics are intended to be used in a Site Monitoring and Targeting program where actual performance is tracked against targets in a timely manner, with deviations triggering a corrective response that results in savings. Two of the main KPIs written back to the real time data base by Visual MESA are the Energy System economics and calculated efficiencies. Each time the system is executed, the potential gap between the current operating the costs and the minimum operating costs is calculated. The savings associated with this gap will be materialized only if all the suggested optimization movements are implemented simultaneously. These predicted savings constitute one of the main economic KPIs. It is expected that, if the operators implement all the proposed recommendations on a continuous basis, the potential gap will start decreasing over time. If in the future the system is in a new condition, a new potential gap will re-appear until the operators make the optimizing movements, and the cycle is repeated. If the projected savings are consistently high, this should prompt Management, Supervision and/or Engineering staff to identify any issue that is impeding the capture of the costs reduction. Most commonly historized equipment efficiencies are: Boilers and heaters efficiency, Gas Turbines Heat Recovery Steam Generation systems (HRSGs) efficiencies, and Gas Turbines heat rate. Their long term trends help to identify those pieces of equipment that can lose efficiency over time and therefore justify cleaning, when possible. Headers imbalances are also usually historized (the software automatically calculates the mass imbalances for each header where a special Visual MESA ad-hoc calculation block, called "balloon" is located). Also, the headers imbalances are often related to sensor failures. A sudden increase of an imbalance would trigger the search for the cause. If a bad signal sensor or an out of range signal is identified, it would need to be repaired and or re-ranged. A proactive support program, which is underway for many of our clients, with the goal of ensuring that the benefits of the project are sustained and that the health of the model is kept in check over time is very important. This advanced sustainability program is achieved by Soteica having remote access to the solution in order to conduct monthly audits of the models. Thanks to this program it has been possible to avoid the short term obsolescence that this type of systems usually suffers. Also, when personnel changes occur, Soteica acts as a transition back-up until the new resource is in place and trained avoiding discontinuity in the usage of the solution. Under the Sustainability program the communication between the technology supplier and the end user becomes very fluid enabling the refinery personnel to develop the necessary skills in order to modify and revamp existing models on their own, as well as using the tool for planning and investment decisions via case studies. When refiners identify that the Total Cost of Ownership, including the sustainability services, has paybacks of less than 6 months they concur that keeping advanced technologies such as Energy Real Time Optimization up and running and evergreen is a logical step. Not only is it profitable but it allows the refinery to operate at minimum energy cost and within emissions constraints, 24x7x365. An on-line tool for industrial energy management has been presented, along with the experiences gained on several successful projects. Energy cost reductions have been obtained taking advantage of the Visual MESA software functionalities. It demonstrated to be a robust optimizer and very well suited to be used on-line, providing optimization recommendations to the operators on a routine basis. The model was also used to evaluate a priori "What If?" scenarios that include modifications or different operating alternatives of the utilities and energy systems. Auditing and accounting of steam and boiler feed water allows reducing steam waste and identifying imbalances. Finally, continuous monitoring allows preventing plant upsets and helps to quickly identify steam wastes. It is important to emphasize the high involvement and motivation of plant operators found since the very beginning of the implementation projects. Coordination among plant areas in order to implement the proposed optimization recommendations is also a critical issue, so management involvement is crucial. The robustness of the tool helped operators to gain confidence on the overall optimization system. Finally, users' acceptance and widespread use, for both engineers and operators, is one of the key issues for a successful implementation. The authors, working tightly with clients and Soteica engineering team members, have participated in many other successful implementations which resulted in significant economic benefits for the refining and petrochemical industries involved. "Auditing and control of energy costs in a large refinery by using an on line tool", D. Ruiz, C. Ruiz, J. Mamprin, Depto. de Energías y Efluentes Petronor, (2005), ERTC Asset Maximisation Conference organized by Global Technology Forum, May 23-25, 2005, Budapest. "Reducing refinery energy costs", Ruiz D., Ruiz C., Nelson D., Roseme G., Lázaro M. and Sartaguda M., (2006), Petroleum Technology Quarterly, Q1 2006, pages 103-105. "The Use of an On-line model for Energy Site-Wide Costs Minimisation", García Casas, J.M., Kihn, M., Ruiz D. and Ruiz C., (2007), ERTC Asset Maximisation Conference organized by Global Technology Forum, May 21-23, 2007, Rome. "Energy System Real Time Optimization", D. Uztürk, H. D. Franklin, J. M. Righi, A. T. Georgiou, NPRA Plant Automation and Decision Support Conference, Phoenix, USA, 2006. "Site-wide Energy Costs Reduction at TOTAL Feyzin Refinery", Département Procédés - Energie, Logistique, Utilités, TOTAL - Raffinerie de Feyzin, D. Ruiz, J. Mamprin and C. Ruiz, (2007), ERTC 12th Annual Meeting organized by Global Technology Forum, 19-21 November, Barcelona. 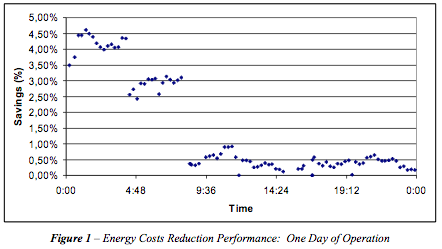 "Online Energy Management", D. Ruiz, C. Ruiz, D. Nelson, Hydrocarbon Engineering, September 2007, pages 60-68. "A Watchdog System for Energy Efficiency and CO2 Emissions Reduction", Diego Ruiz, Carlos A. Ruiz, European Refining Technology Conference (ERTC) Sustainable Refining, Brussels, Belgium, April 2008. 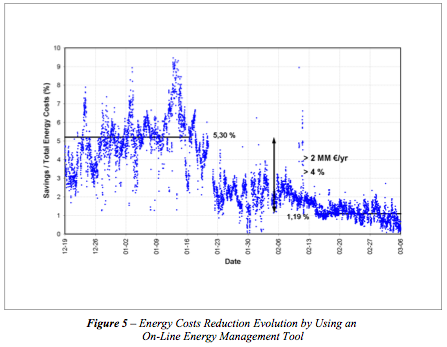 "Online energy costs optimizer at petrochemical plant", Marcos Kihn, Diego Ruiz, Carlos Ruiz, Antonio García Nogales, Hydrocarbon Engineering, May 2008, Pages 119-123. "Finding Benefits by Modeling and Optimizing Steam and Power Systems", M. Reid, C. Harper, C. Hayes, Industrial Energy Technology Conference (IETC), New Orleans, May 2008.